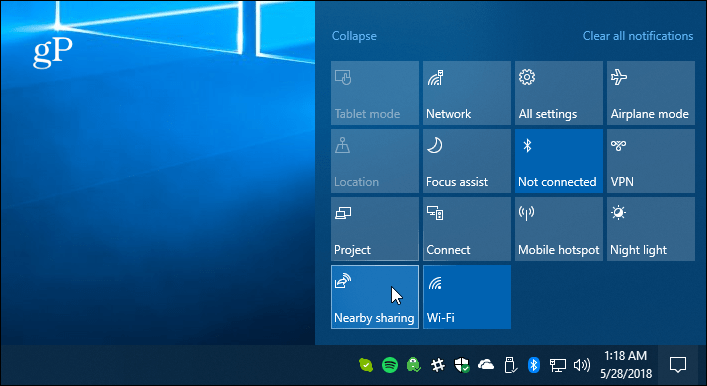 Similar to Apple’s AirDrop feature, Windows 10 1803 has Nearby Sharing that allows you to wirelessly send files between devices. Microsoft’s new feature update for Windows 10 1803 includes a good amount of helpful new features. One of which is called Nearby Sharing which allows you to wirelessly transfer files and links to other devices that are near your PC. It’s similar to Apple’s “AirDrop” feature. We covered how to share links from Microsoft Edge using the new ability when Windows 10 April 2018 Update was still in Preview. Now that that Windows 10 1803 is finally done, here we’ll take a more in-depth look at how to use it to transfer files to nearby devices over Bluetooth or Wi-Fi. First off, you need to have Bluetooth enabled on both devices. You also need the Nearby Sharing feature turned on. You manage it by heading to Settings > System > Share experiences. There you can choose who to share and receive content from and the folder the received files are stored. Note: You can turn Nearby Sharing, Bluetooth, and Wi-Fi on or off via the Action Center. Hit Windows Key + A to launch Action Center and click the appropriate button to turn the features on or off. If you don’t see one of the buttons, go to Settings > Notifications & actions > Add or remove quick actions and enable the button you need. 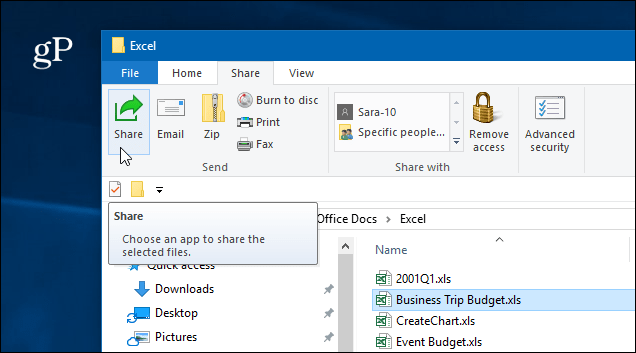 Open File Explorer and find the file you want to share with another device. Then click the Share tab from the Ribbon and then the Share button. Or, a quicker action is to just right-click the file you want and choose Share from the menu. Either way, a second window will open that lists nearby devices, contacts, and other apps you can choose from to share the file. If you’re sharing the file, you will see a notification that the device is being contacted to send the file. On the other device, a notification will pop up, so the user can accept or decline the transfer. If there is no response or something isn’t configured correctly, the transfer will timeout. And you will find the file saved in the Downloads folder or whichever one you set it to in the Shared experiences in Settings. 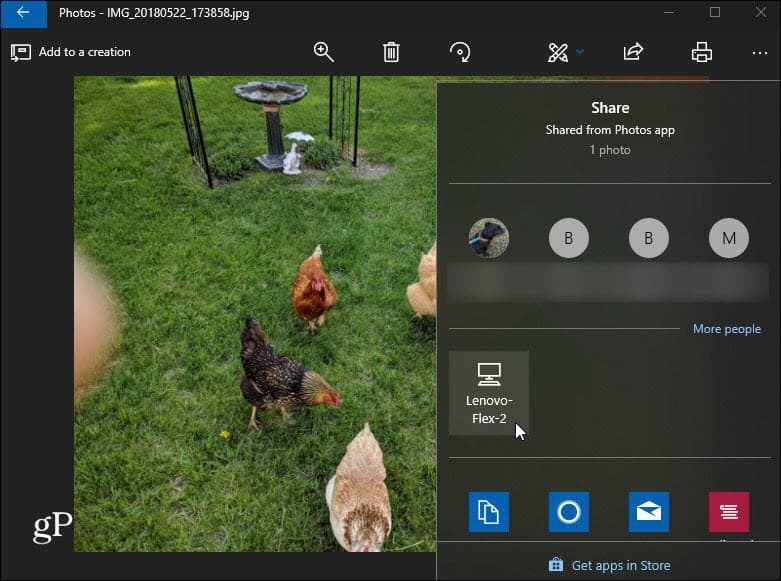 You can share pictures through the Photos app and links via Microsoft Edge. Sharing them is similar in both apps. To share a link to a webpage, navigate to that page and click the “Share” icon in the toolbar and choose the PC to send the link to. Same with the Photos app. Find the picture you want to share, click the Share icon and then the PC to send it to. A few things to keep in mind here. The device you’re sharing a file with needs to be within Bluetooth range and running Windows 10 1803 or above. Both machines will need to have Bluetooth 4.0 or above. 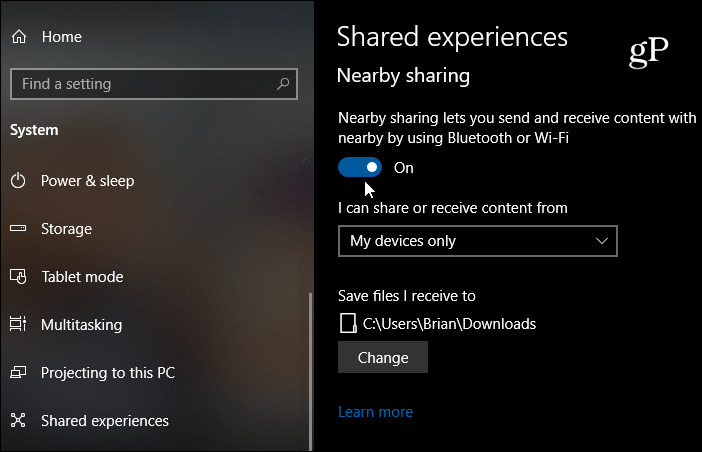 Also, Nearby Sharing isn’t available for files in OneDrive because it already has its own file sharing experience. If it’s not working, verify everything is set up correctly as explained above… i.e. Near Share enabled on both devices. Also, make sure your Bluetooth driver is updated. 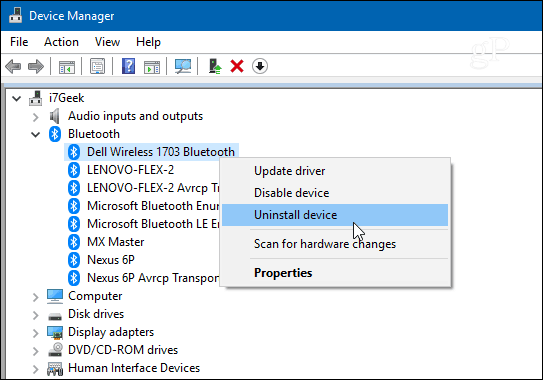 In fact, for me, I needed to uninstall and reinstall my Bluetooth device on one of my PCs to get it working correctly. You manage that in Device Manager. And this works best for transferring documents and other small files. If you try to transfer a large file, it will be ridiculously slow, and in that case, using a flash drive will be much easier. 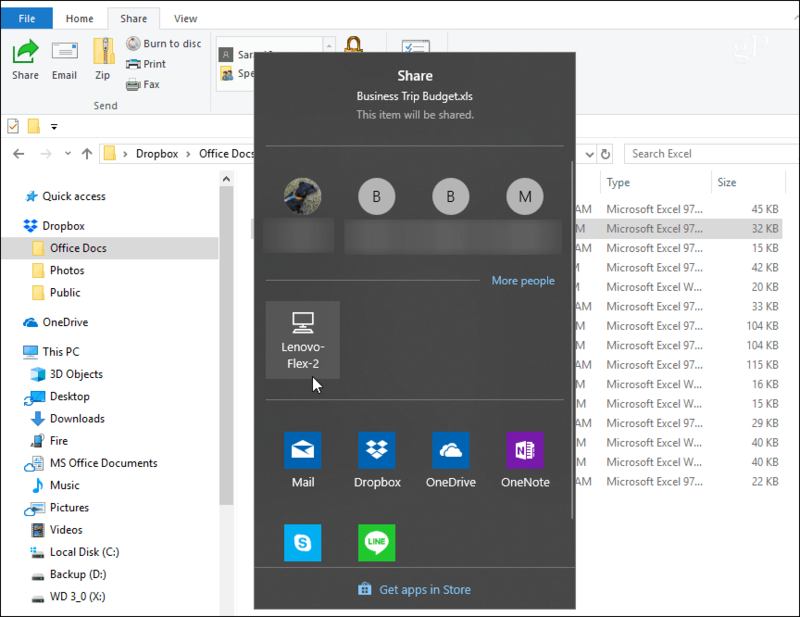 The file sharing experience isn’t a perfect one yet and Microsoft still needs to work out some kinks in Nearby Sharing. Still, it should improve over time, and it’s quite handy once you have everything set up. Give it a try and let us know what you think. If it’s not working and you need troubleshooting advice, hop into our Windows 10 Forums for more discussions. HomeGroup worked so well, and was so simple to use. I hust wonder why microsoft in their indefinite wisdom chose to burden us this way? yesterday got feature update to 1803 but after update i got brightness issue which stuck on max i cant adjust my brightness u[dating driver cannot fix this issue . hope microsoft will fix this bug soon in new cumulative update. Ask the Readers: Have You Upgraded to Windows 10 April 2018 Update Yet?